Mark McCosker receives his trophy after his win in Saturday''s Stableford competition sponsored by the Stanthorpe RSL Sub Branch. 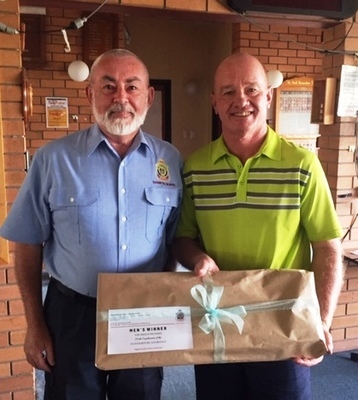 Mark McCosker found himself at the winner’s podium again this week; not presenting trophies as he did the previous week but collecting the winner’s prize after he returned the winning score of 40 in the Stableford contest at the Stanthorpe Club last weekend. It was a very close contest with David Burgess also returning the same score. However, a score of 22 points on the back nine by McCosker was just enough to hold out Burgess who had a score of 21 on the same nine. Margie Locke returned a score of 38 points to win the Ladies event two shots in advance of Madeline Jarman who with 36 points had to settle for the runner’s position. In the run down, it was a ball each to scores of 37 and better for the men and 34 and better for the ladies. Greg Fraser collected the balls for his pin shot at three and Stan Spencer collected at 17. Stephen Kay was on song at 12 before racing off to hand out the prize money to the winners of Busking Stanthorpe 2019 alter in the afternoon. The Ladies’ pins went to Kay Webb at three and 17 and Margie Locke at 12. The Pro-pins were won by Ricky Chapman (1/10), Sinbad (5/14) and David Burgess (9/18). Rob Reeves picked up the Birdies Best at the first hole. The RSL Sub Branch sponsored the day and not only was their sponsorship greatly appreciated but also their hard work on the hot plate providing hot snacks. Renovations to the greens were completed on Monday and it is going to be interesting to see if that causes putting difficulties in this week’s competition. Players will be hoping the greens do not take too long to recover from the ordeal. The work was completed quite quickly thanks to the band of youngsters who assisted the old hands with the work. Thanks to Neta, Kay and Helen who kept the workers hydrated and well fed while the work was carried out in the hot conditions. With another month drawing to a close the competition is the end of the month medley 4BBB Stableford. Tee off is 11.45 am with a shot gun start. Please note registration is to be completed twenty minutes prior to allow for tee designation. The BBQ will be operating for the afternoon.